Provide comfort for the family of Edna Ficke with a meaningful gesture of sympathy. Edna (Postel) Ficke, 98, of Independence, MO, passed away Feb 6, 2019. She was born Dec 7, 1920, in Cole Camp, MO, the youngest of the six daughters of H.J. and Theresa Postel. From 1961 to 1993 Edna was the school secretary at Elm Grove Elementary in the Fort Osage District. Edna was bright, fun-loving and enjoyed people. She was a fan of the Chiefs and Royals, and followed other sports, loved Scrabble and liked to travel. 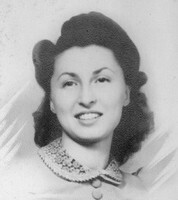 Edna was married to Charles Ficke from 1947 to 1980. She leaves daughters Gail Howell, NC, and Rhonda Fogel, CO; grandchildren Megan and Sheila Thiele, CA, and Doug Farchmin, MO; one great-grandchild, nieces, nephews, and friends. No services are scheduled. To send flowers in memory of Edna Theresa Ficke (Postel), please visit our Heartfelt Sympathies Store. Consider providing a gift of comfort for the family of Edna Ficke by sending flowers. Provide comfort for the family of Edna Theresa Ficke (Postel) by sending flowers. Edna gave "mother's hugs" to soothe the loss of our own mother when I was a fifth grader at Elm Grove. Genuine mother love is what I felt then and continue to feel from Edna when invoking her memory. For this child who had lost his mother, her hugs were an oasis of love. Edna was Elm Grove. She took care of everyone at school as if they were her children whether they were students or employees. Her office was run with love and efficiency. I was only at Elm Grove for 2 years but she made me feel welcome and helped adjust to my new surroundings. Everyone who knew Edna has great memories of her generosity and acceptance for all. May those memories help in this time of sadness.